Last night, as would be expected, there was a lot of church activity in the village. The bells of the church next to our apartment were getting a full-on workout, not only with the usual peel telling us the time but there was a special Christmas ring as well. 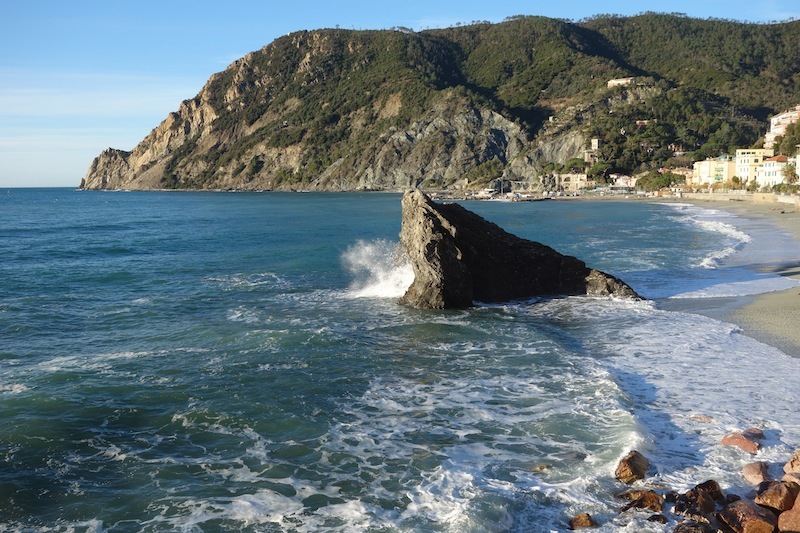 Today we did very little other than spending time on the beach and taking a walk along the Monterosso foreshores. 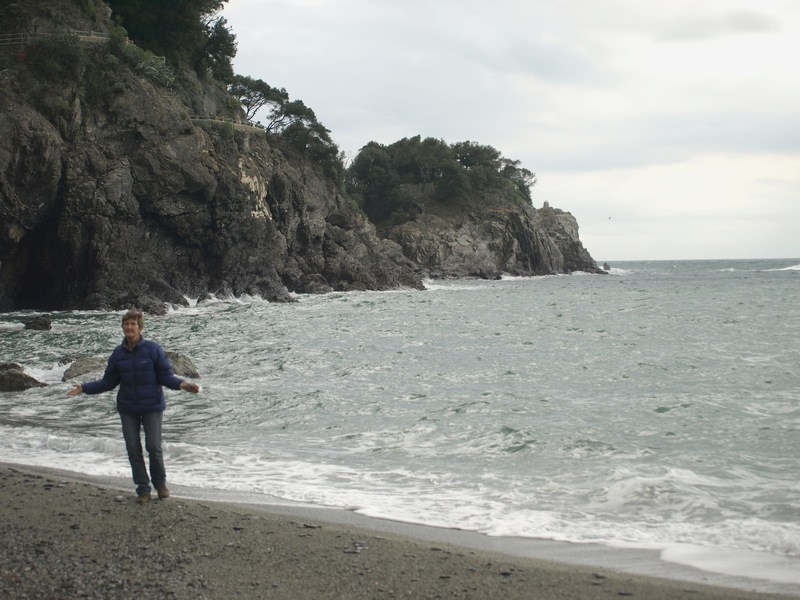 If you were to paddle a kayak for 1200 km from Monterosso due south you would hit the foreshores of Tunisia. 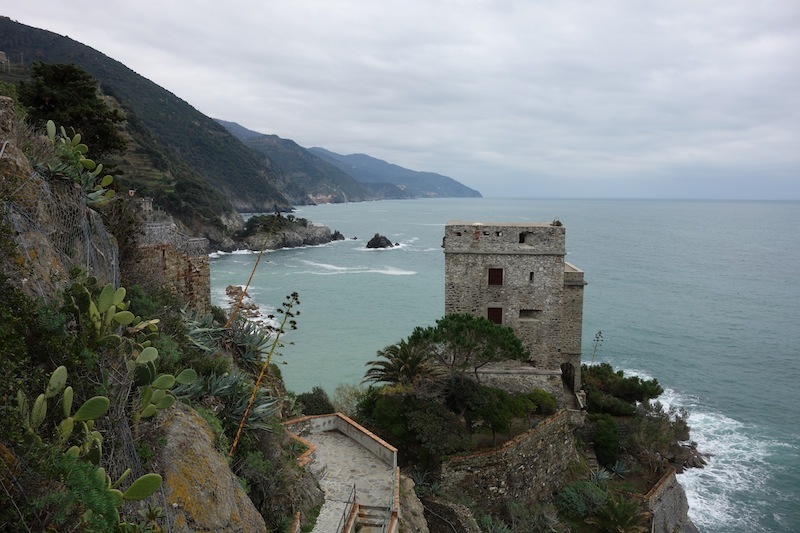 The western view from the headland which divides the old and new towns of Monterosso. 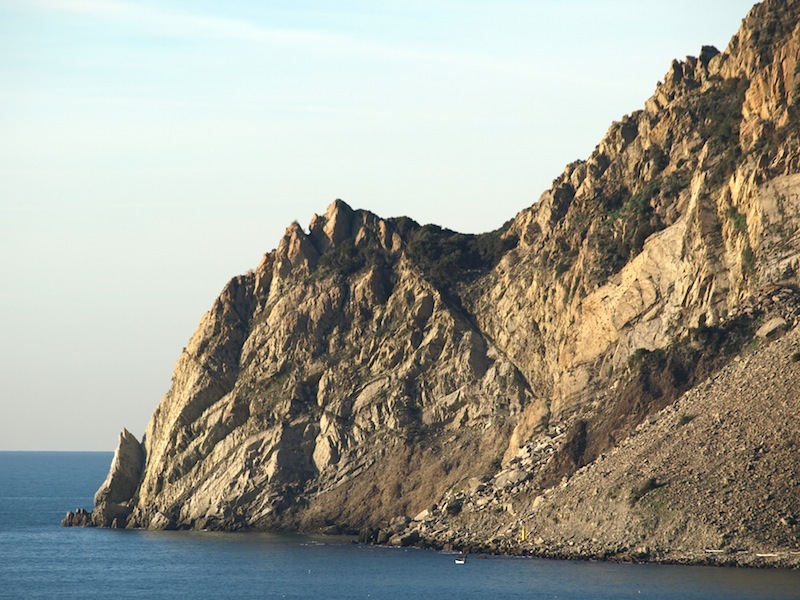 The far point is called Punta Mesco. Close up of Punta Mesco. In ancient times sandstone was mined here. 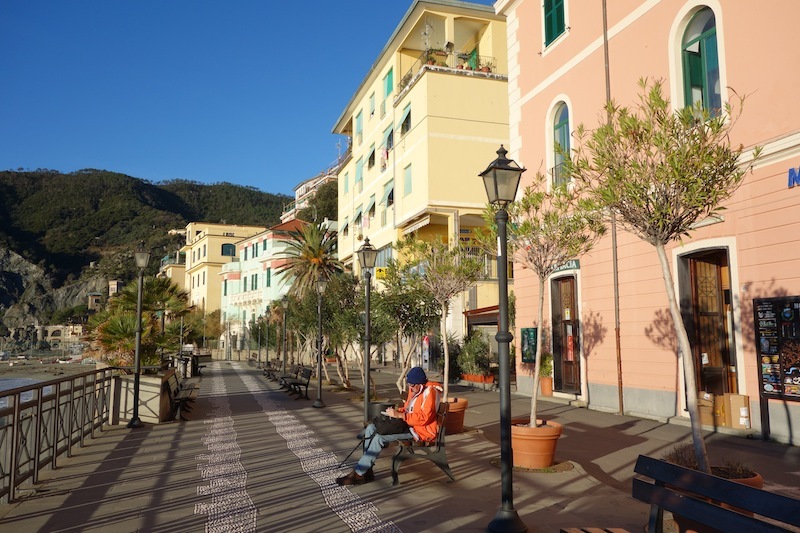 The new town area of Monterosso. 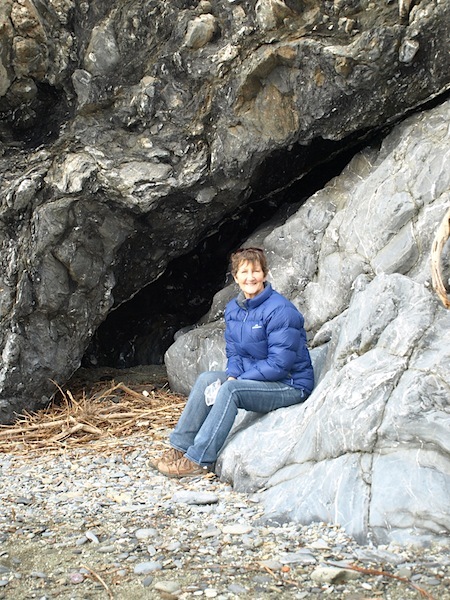 Christmas Day and no tourists! 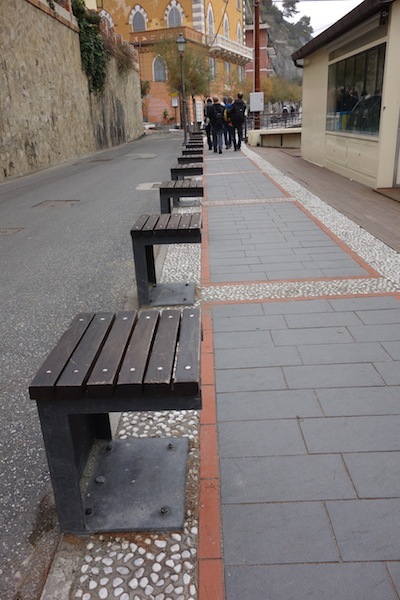 Interesting street furniture serving two purposes..providing seating and stopping cars from parking on the footpath. This is the view to the east from the headland. 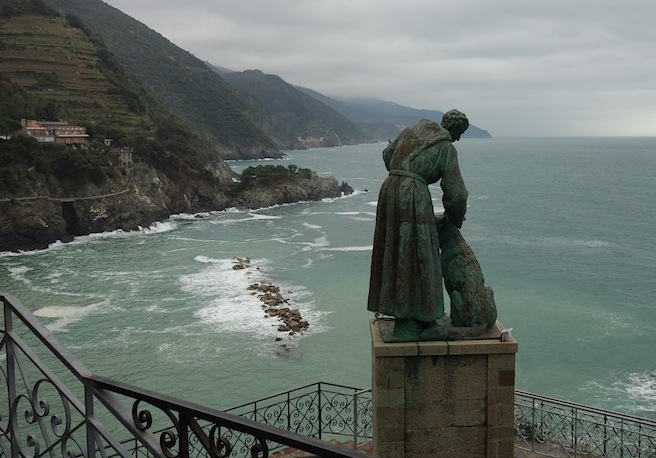 Capuchin monk St Francesco with his dog. Another view to the east with the medieval Aurora tower. 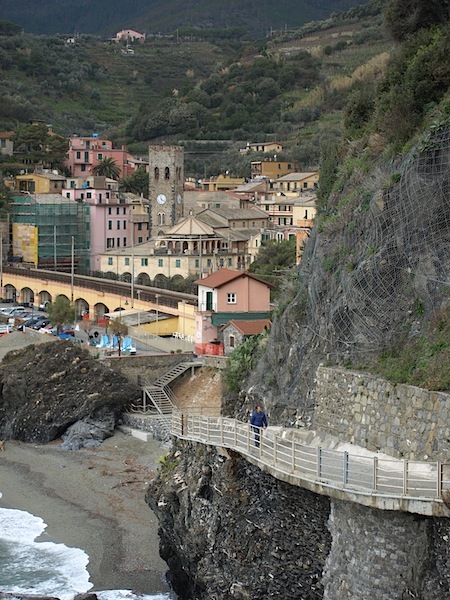 A walking track runs from Monterosso to the east along the cliff face. Unfortunately it was closed as part of the track had fallen into the sea. At the base of the western headland is a WW2 bunker. 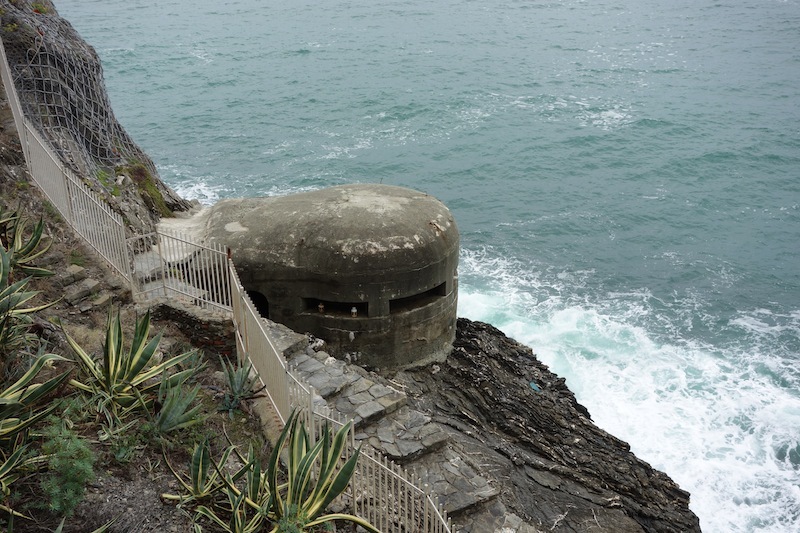 Bunkers like this are scattered all along the Italian Riviera coastline. 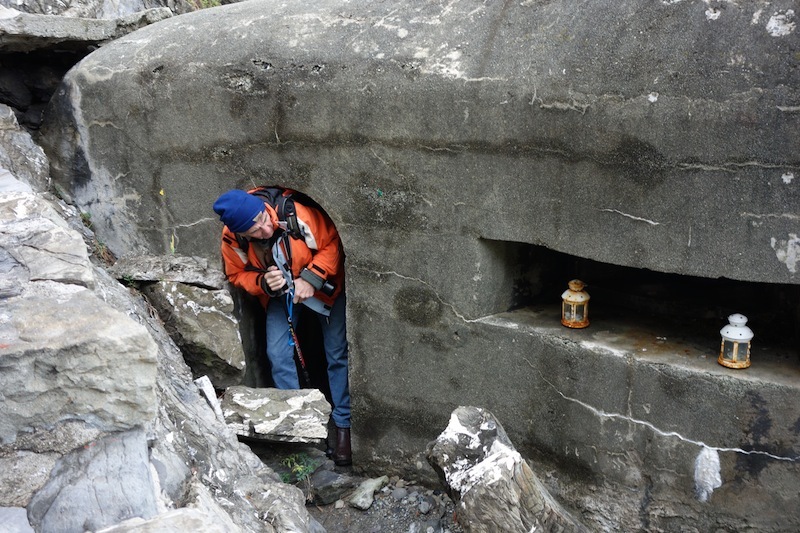 Entrance to the WW2 bunker. I wouldn’t fancy being inside if it was being bombarded as it was very claustrophobic. 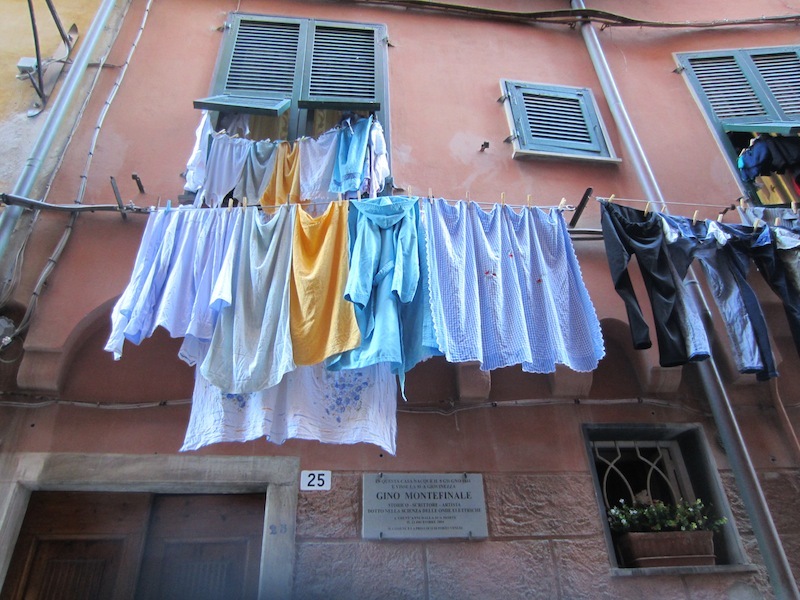 Because there is nothing much to report today I thought I would take the opportunity to show you my ‘washing folder’. I think the folds in the sheet here could be classified as ‘catenary’ folds. 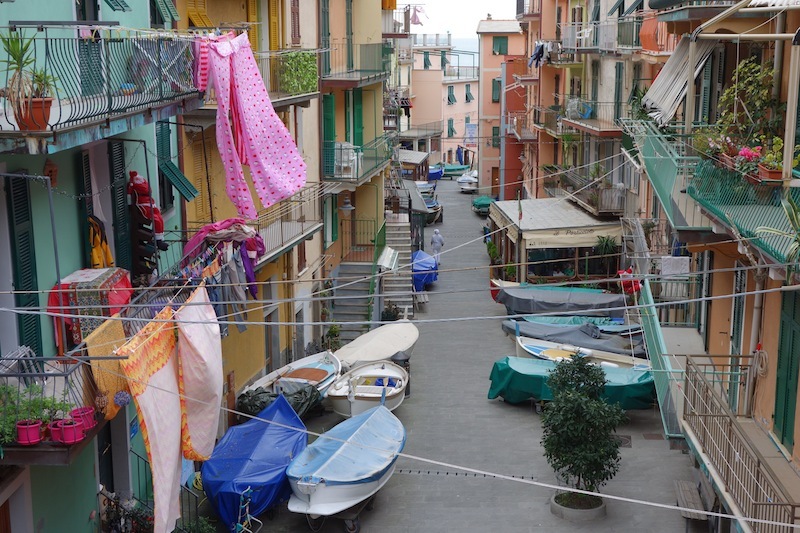 Apartments in all the towns of the Cinque Terre are brightly painted and, as is the case here, bright washing adds even more colour. 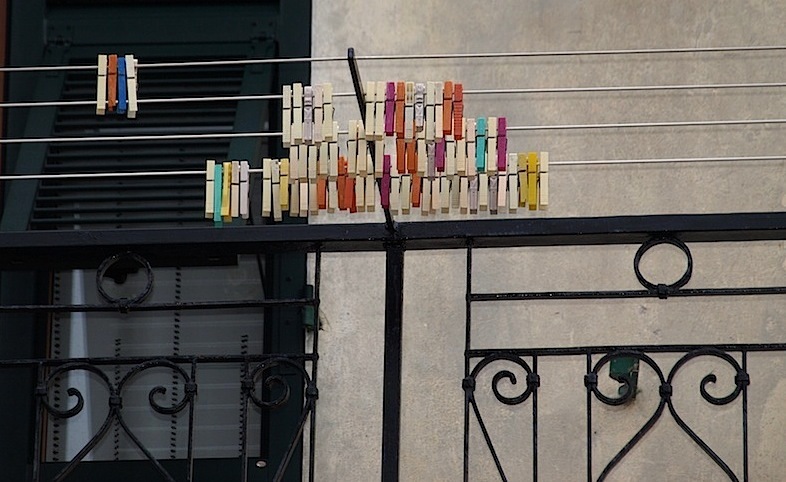 I once spoke with a woman who couldn’t hang out the washing unless the colour of the pegs matched the colour of the clothes. Although this image has many interesting features such as bi-directional shutters it’s the washing that makes the composition interesting. 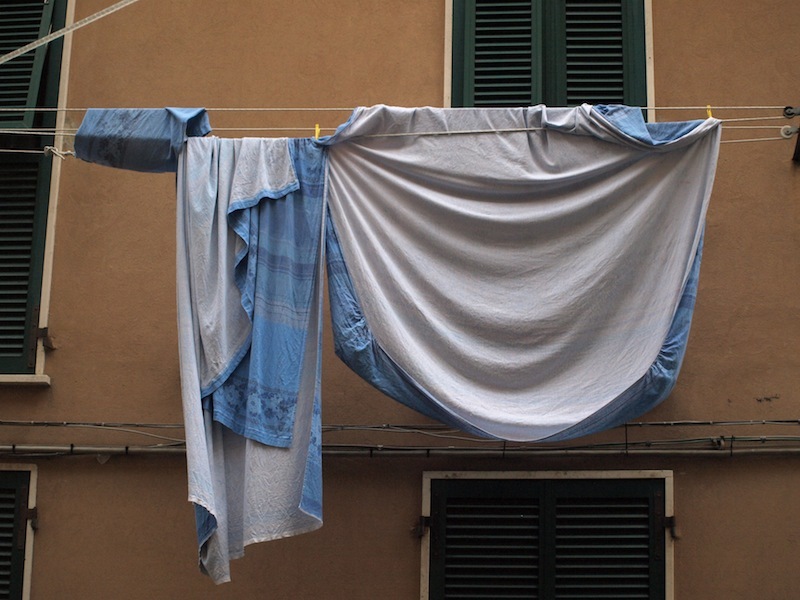 This is my favourite washing shot. Are these mourning clothes belonging to a widow or to someone who simply likes black. 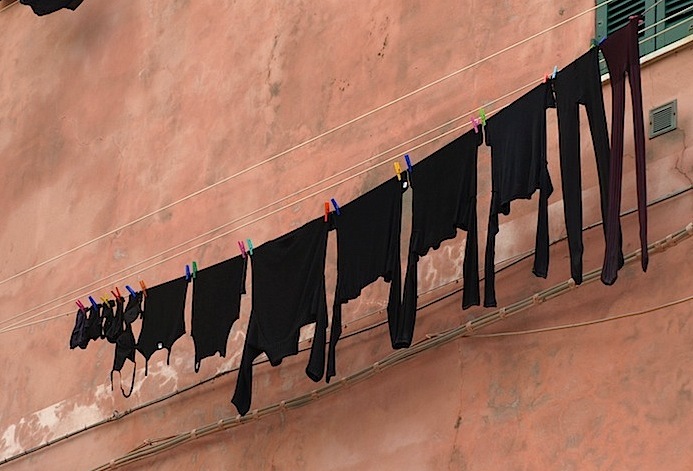 A Catholic widow (according to Catholic Church law) is required to wear black for two years. After one year another colour such as white can be introduced. However if a young widow meets a desirable bloke she can abandon the black after the first year. Tomorrow is Boxing Day. Arguments abound as to its origins; following are a couple of possible origins. A ‘Christmas Box’ in Britain is a name for a Christmas present. Boxing Day was a day off for servants and when they received a ‘Christmas Box’ from the master. Also the servants would go home and give ‘Christmas Boxes’ to their families. A box to collect money for the poor was placed in churches on Christmas day then opened the next day.